Flagstaff House executive chef Chris Royster got his start washing dishes at a small family-run restaurant in New York state at age 14. After discovering his passion for the culinary arts, he steadily moved up the ranks to land his first executive chef position at the wunderkind-age of 17. 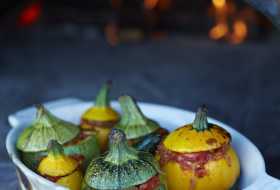 He relocated to Colorado after a few years, settling in the Boulder area and working the kitchens at well-known Boulder County restaurants Zucca and The Huckleberry, where he became executive chef after just one year. In 2012, he jumped at the chance to take on the role of chef de cuisine at Flagstaff House under esteemed executive chef Mark Monette. Chef Chris is a past recipient of Zagat’s 30 Under 30 award and was crowned one of Food Network’s “Chopped” champions in 2016. 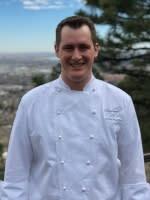 The Flagstaff House’s daily changing menu under Chef Chris is anchored by elegant and deceptively simple dishes, complex in flavor with exotic influences that reflect his extensive overseas travel while maintaining the restaurant’s storied Colorado roots. Flagstaff House was recently awarded a AAA Four Diamond rating. Get up early on one of our 300-plus sunny days to drive up Boulder Canyon and get an early start with some fly fishing on Boulder Creek. The views are spectacular and the easy access can’t be beat. Plus, in the mornings there are rarely any other anglers out there. After a few relaxing hours on the water, I’d head over the Boulder Farmers Market. I’m obsessed with eco-conscious cooking and supporting local farmers and merchants, so browsing all the stands, talking to the vendors and sampling bites from all the snack spots is one of my favorite things. Pro tip: I also love the market on Wednesday nights. 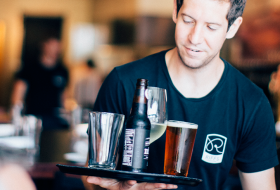 It’s a little more low-key and they serve local beer. 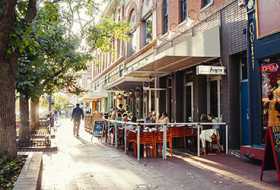 Next, I would head over to Pearl Street for an afternoon of restaurant hopping: If I’m going out to eat and drink, I like to go tapas style, having a drink and plate at one place then going on to the next. Boulder’s got a lot of culinary talent, and this is a great way to really get a sense of what everyone is doing. To end my day, I would drive up past Chautauqua to the Flagstaff House. I know, I know — it’s my restaurant! But it’s rare that I get to experience what we do from the other side of the table, and what we do at Flagstaff is truly unique. 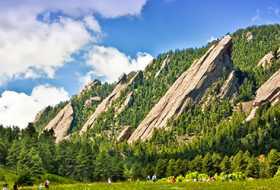 We have a view unmatched in Boulder County (maybe even the state), and whether it is just a drink at the bar, a few small pates on the terrace in summer or a full fine-dining experience, it’s the perfect place to end a perfect Boulder day.